In 1990 Tony Harrison shocked and riveted London audiences with his production of Trackers of Oxyrhynchus, which pits an ancient text, Sophocles’ satyric play Ichneutae, against the inevitably objectifying and alienating mechanism of historical analysis. With unflinchingly raw social realism, Harrison not only raised questions of high and low art, of the validity of the Classics in a world far removed from their material (and for some their philosophical) reality, of social binaries; he sought to problematise the meaning of humanity and perhaps its socially imposed spiritual limitations. Harrison contrasts the Apollonian and the Dionysiac, the ancient and the modern, entitlement and depravity, violent primal energies and civilisation, sense and incoherence in a play that offers no easy answers while making evading the questions outright impossible. Exposing both elitist and populist instinctive drives as catastrophic, Harrison also forced his audience to shed their comfortable shelter of the theatre, of make-believe, of abstraction and intellectual distance. The first London performance took place at the National Theatre, a cocoon of thought, reflection, performance and creation thriving under the aegis of Aristotelian awe and pity, yet surrounded by the more dire and awful drama of the troubled and numberless homeless taking refuge in the underpass leading to it, or in the arches of the Southbank Centre. At the end of Harrison’s play the Satyrs, denied of the right to the music and culture they yearn for, transform into hooligans wielding boom-boxes, the walls of time breaking down to reveal the trauma of a humanity denied its transcendence, revelation and spirituality. The walls of the theatre also broke down for the audience, revealing the stage beyond the auditorium where that other, ‘real’ social drama was taking place. Harrison cannot explain the hooligan or the outcast soul other than put it within the frame of its conditions and socio-historic factors; like Primo Levy, perhaps he feels that we must not attempt to understand, even as our humanity must act as the notional and ethical catalyst in order to derive meaning – and also a vital optimistic vision. In the poem ‘V’ he offers a tactile tableau of the experience and the psyche of marginal lives, a record of their voice, pathos, despair, cruelty and destructiveness. Both Trackers and ‘V’ have an inexorableness and clarity that is haunting, paralysing, they possess a fiery conscience that you cannot walk by and ignore. Dance by the Canal by Kerstin Hensel can be said to aspire to a similar examination and transcription of what we accept as our human condition. Hensel tasks herself to follow with her character the journey from personal existence to homelessness and facelessness, from being to social (or even existential) non-being. She seeks to trace and record the deviation from the presumed, accepted and approved path of human life. She attempts to identify what guarantees our difference from or constitutes our inescapable sameness to those we see but do not perhaps acknowledge as ourselves, as part of our experience, our comprehensible world. Dance by the Canal offers a startling tableau, combining meiosis of the situation and hyperbolic emphasis on its momentum and significance. It uses a warped, unreliable perspective that persists throughout the narrative. Packing paper lying at the feet of a homeless woman has been serendipitously sent to her, we are assured, because her destiny is to be a writer and tell the story of her life. “A task I once hated and was coerced into doing has now become a need” as the fictionalisation of the self becomes both its reality and its virtual truth. Time and perception are distorted, disfigured, stretched or condensed, fused or anatomically dissected, under the rule of an ‘I’ that is at once all-powerful and totally erased. Gabriella von Haßlau, who will have as many names throughout her story as she has personas, writes meticulously and laboriously from the perspective of the adult with the voice and spectrum of awareness of a child. Details loom larger than life or possess a phatic quality that is horrific in its unadmitted ramifications; episodes are vested with weight and significance in an almost myopic game of multiple reflections. A violin and a music teacher of sinister fascination become the pivot of a forbidden bourgeois existence in a dehumanised, communist scenography resplendent with materialistic vacuity, dark figures, vice and vast loneliness. History happens everywhere and elsewhere in Dance by the Canal yet Gabriella seems keenly unaware of any dimension beyond the almost autistic relationships of her fast-dissolving world. This is a deeply troubling, densely tangled narrative, reflecting at every turn “the state of meaninglessness… a condition that settled [over life] like a fog” at every level. It is a stiflingly self-referential world of the clinically homeless, of the adult-child that has resulted from almost unutterable traumas. We move between past and present breathlessly, as though pursued by a darkness that should not exist even in one’s imagination, through stages of narcosis and what Gabriella calls awakening –“awakening was the worst”. It is an obsessive, obliterating journey, a deadly compulsion which does not lead to a cathartic revelation, for all its intensity, its clawing into the wound of the heroine’s existence. Hensel’s images could be called Goyaesque as well as Dostoevskian in their clarity, insanity, brutality and human despair. She is able to implicate us not only in her own project of fleshing out the life of Gabriella von Haßlau the noble-born, abused, abandoned, determined clochard, but also in Gabriella’s choices, in her tunnelling vision, her messianic prose. Her process of holding up for scrutiny, as though with forceps, the past and present of East and West, of a unified Germany, is highly original, dismissing categories, easy judgement or any naturalness in the transition. We are exposed in our ignorance, in our theoretical engagement, in our academicism and efficient social organisations. We are also tricked repeatedly, and by the end of the novel we are perhaps baffled that something may be amiss beyond our conscience. The conceit of the unreliable narrator, which serves Hensel well for most of this short novella as her vehicle for the darkness and the light humanity of her character, claims an audacity and arrogance of its own by the end of the story, at which point either the translation or the narrative thread misses its mark. Dance by the Canal has the blackness and pain of our time, and of a trauma that is timeless; in its English version, it also has shortcomings of structure and of intent, of voice and of direction that are not fully compensated by the intense emotional experience, the journey of moral conscience that it ultimately offers. Kerstin Hensel was born in 1961 in Karl-Marx Stadt in former East Germany and studied in Leipzig. She has published over 30 books: novels, short story collections, poetry and plays. She has won numerous prizes, including the Anna-Seghers prize as well as the Lessing prize for her entire body of work. 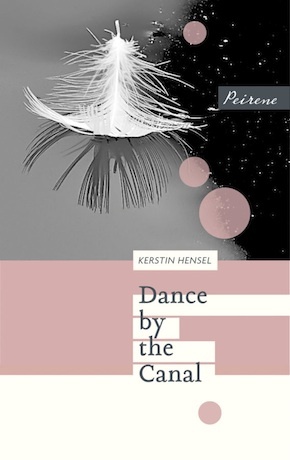 Dance by the Canal by Kirsten Hensel, translated by Jen Calleja is published by Peirene Press. Jen Calleja is a writer, literary translator, editor and musician. 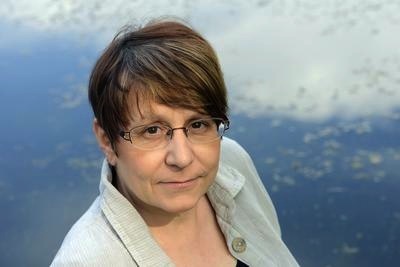 She has translated book-length works for Fitzcarraldo Editions and Bloomsbury, as well as short fiction, essays, articles and poetry. Her debut poetry collection Serious Justice was published by Test Centre. She is columnist for literature in translation for The Quietus and translator in residence at the Austrian Cultural Forum London. She is also acting editor of New Books in German and editor of Anglo-German arts journal Verfreundungseffekt.